Product prices and availability are accurate as of 2019-04-14 01:46:45 EDT and are subject to change. Any price and availability information displayed on http://www.amazon.com/ at the time of purchase will apply to the purchase of this product. 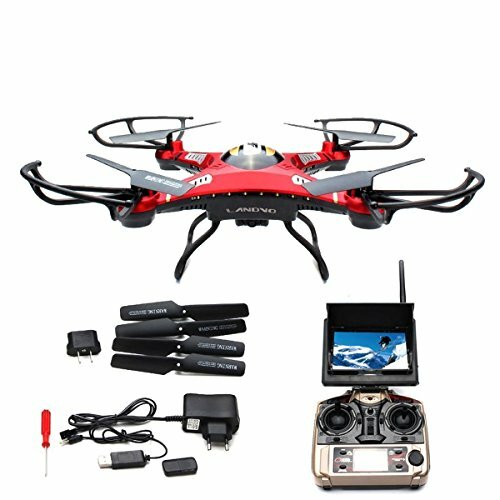 1.This drone is for experienced rc pilot more than 14 years, please read the manual and do some practice before flight. This drone is WITHOUT altitude hold function, DO NOT loosen the throttle during the flight! 2. Use AA alkaline (R6S) batteries instead of rechargeable/ large capacity batteries for the remote control, or the signal between the drone and the remote control will be interfered and the drone cannot work well. 3. Take a break every 5mins flight. In case that the drone is blocked, please don't pull the accelerator, or the motor will burn out easily. 4. Pay attention to the RED lights direction when using one key return function. When the red lights are facing you, the drone will come back to you, or it will go away from you. 5. If the controller cannot control the drone, please press the roll over button then push both two joysticks to left at the bottom to get them reconnected. 6. The lcd screen and the battery charger are in the white boxes on the back of the plastic container. JJRC H8D drone with LANDVO logo is equipped with a professional level of aerial 5.8GHz high-definition camera, maximum up to 2 million pixels, it can be realized in the air to take pictures, video and other aerial capabilities, and real-time transmission to the image on the LCD screen. Exclusive first dual control mode, with the player operation for novice entry-level model and the professional player's technical level model. Truly a multi-purpose machine, indoor and outdoor operation of the model, suitable for a very wide range of players! Remote control can freely switch for about throttle control, more suitable for multi-regional multi-range of people to use. New CVT function, can achieve 10% -100% to seamlessly shift, gradual acceleration and deceleration can be 1%, according to the player's own proficiency and space operations to fully fit players to choose gear. This product uses the 2.4GHz band signal, the operation more precise, more responsive, more distant remote control, can simultaneously in the same place each control more than one aircraft without mutual interference ; The product has a 360-degree roll function, in front, left in different directions roll, roll speed sensitive, precise positioning! Unique product design, replaceable aircraft batteries, so you can enjoy a long uninterrupted remote control aircraft excitement pleasure!